The first thing she noticed was the silence. There was no wind, no rustling leaves, no birds calling, just the faint gurgle of distant running water. She glanced around for her parents, but they were nowhere to be found. Her chest clenched with the childish fear of being alone. She fought the feeling and reminded herself she was six, almost seven. She peered into the distance but found her view obscured by a dense fog. The only outline was a bridge. She set off in search of an adult. She was tired from the journey but couldn’t remember how far she had come. It was time to rest. Something about the bridge pulled her forwards, each step lightening her burden. There was nothing behind her, just a thick grey blanket that followed on her footsteps. He gestured to a box in front of him which contained a simple slot. After a moment of panic she checked her pockets and was surprised to find a silver coin. She placed it carefully into the slot and waited. The figure examined her carefully before opening the gate. As she stepped into the unknown the fog dissipated and her eyes grew wide. Well, you know what they say. Don’t pay the ferry man. Enjoyable, I liked the ominous opening. Oops, just saw its only a 5 word leeway this week. Can I trim a few? Absolutely. I was about to tweet you anyway. –Email me (via contacts page) w/ revision, and I’ll swap them out. WHOOOOSH! and with a flourish of the dragon wand, it’s done! Nicely done. Great atmosphere throughout. I loved it. Very well done with a delightful twist at the end (and within 50 minutes of the prompt being posted.. you are fast too) Thanks! A well paced, great take on the prompt, with a lovely punchline! Nice good twist, for a change, I was waiting for the worst! Amber’s shoes made a ‘thunk’ as they hit the old wooden planks of the metal framed bridge. The wind was still and the area of the park was quiet in the late afternoon. No one had seen her come on the grounds, not after she eluded her parents. Amber knew where she was going, following the voice that whispered to her. She was closer now, Amber could feel it. There was something about the bridge that had caused her speed to slow. She couldn’t hear the birds anymore, and the heat was barely noticeable here, even though she had been sweating on the walk up. Serenity filled the air, drawing force and all present. Amber’s old green sneakers stepped off the bridge and into the soft grass that waited. There was a pause as the young girl smelled the sweetest lilies, lilacs, and wysteria that circled the grove. Closing her eyes for a moment, Amber felt better than she had in a long time, ever since the nightmares had begun. When her eyes re-opened things looked just a bit different, cleaner cut and even more inviting. Amber turned quickly on her heel, facing the wall of old pine trees and layered moss that now stood where the bridge had. Suddenly she wanted her parents again. Fear mounted, until she heard the singing. The softest of voices cooed a jaunty tune that sounded quite welcoming. Amber proceeded forward again, picking up her pace to round the corner of trees that was obfuscating the songstress. She was pleasantly surprised to see the red and white blanket laid out with multiple baskets of food and cups of tea. The woman with the dark hair and blue dress offered her a place to sit with an outstretched hand. Oh dear! I wonder what nasty sorts want this poor child dead. A chilling tale. I’ve a feeling this child is going to meet quite a few sticky ends this Friday! It was not the same as with the others. I told myself that as I watched Ezmerelda start across the old wooden bridge. Her sandals patted the wood slats with a softness instead of the pounding I heard most often. I grew slightly dizzy gazing at her departing stride, her back facing me, almost mocking me. “I am leaving! Do you care?” it seemed to scream at me. My mind yelled back, “Yes! Please don’t go! Stay with me forever!” though I said no such thing. Actually, I stood in stupefied silence. The girl of my dreams was leaving. In a few more steps she would be on the other side and out of my life forever. I was not certain I could handle that event. I was nearly sure I could not. I brought my hands up to my head, covering my ears with my palms and leaving my fingers free to tear at my hair. I took half a step toward her. Before I could take the second step and touch the bridge, I heard the “Harrumph” from Our Lady of the Star, Sister Jocine. I stopped. I knew I could not follow. It would not be right, and I was not sure if it was even possible. I looked at the Sister. She nodded she understood, but followed it with a curt and deliberate shake to make sure I understood. I did. I turned my head back around and saw Ezmerelda was just a few feet from the other side. As she got to the very end of the bridge and started to fade, she turned, looked at me, and threw a kiss. “Bye, Mommy! Don’t worry. I will be back when I am all done with living.” With that she stepped over and back into life. Bittersweet and actually rather full of promise. It sounds as if she’s got a very important mission. I loved the twist at the end. Very nice. I like your judicious use of description. Just the right number of words. The spectral cowboy shook his equally ethereal wife, who had fallen into a sleep state, and temporarily shifted to another realm. When she returned a minute later, she was moaning and sobbing. Aferdita nestled against her husband and took comfort in his embrace. “Thank you, Baby,” Aferdita whispered. There’s more than one kind of undead – decidedly wicked! She’s here. I can hardly believe it. I always believed she would return, though her absence these last three hundred years had given me sufficient cause to doubt it. She grips the handrail. Her knuckles are white. She has crossed this bridge before, but has no memory of it. Why should she? It was her choice to become mortal. She stops, braces, reaches for the staff at her side. Even in this primitive new form, her bravery is unparalleled. Her lapse is just the opportunity I need. Taking the form of a strong wind, I blow her right off the side of the bridge. Just like last time, she shrieks and plummets to her death. Excellent take on the prompt; great back-story. Ooh spiritual sibling rivalry love the take on the prompt. Really enjoyed this, love the idea of 300 years of brooding and plotting! I’m a good girl. I always do what I’m told. When I got home, she was drinking out of her special bottle again, the one I’m not allowed to go anywhere near. Her eyes had gone all funny, and it made me go quiet inside when I saw her. ‘Get lost!’ she told me. ‘Go, on! Get lost!’ She called me a horrible name, too, but I know she didn’t mean that part, so I didn’t cry. But she meant the other part. About getting lost. I turned all the wrong ways when I went out through our gate. That way I knew I’d get lost as quick as I could, and Mama would be happy again. I passed a lady with pictures all over her arms and lots of red lipstick on. Mama’s got a name for ladies like her, and it isn’t nice. So when she asked me if I was all right, I just put my head down and kept going, really quick. Then I got to this huge park. There’s a river in it, and everything. I like the sound my feet make as I walk across the bridge. I sound like a horse or an elephant, and it’s funny. My tummy growls, like a lion. There’s a nice man up ahead. He has a suit on, and he has shiny shoes, and a shiny smile. ohhhh. Way to chop my heart up into pieces. Wrenching, terrible, well-written story. Heart wrenching tale narrated with innocence. I always enjoy your stories, Sinéad. Very sad ,but good story. Oh my goodness, this makes me nervous just to read it! This poor, good little girl. Chilling ending. Great use of the first & last line dichotomy. Yes, heart wrenching indeed! I also love how you play with the different stereotypes. Your writing is always so crisp. Why, thank you, Marie. 🙂 Thanks to everyone who’s commented on ‘The Good Girl’ – I appreciate all your feedback very much. I loved the voice of this, just right for the protagonist. The line ‘I turned all the wrong ways when I went out through our gate’ is particularly wonderful. I watched her cross the bridge. As she walked, she shed the cares of this world, pitching them over the side and letting the water sweep them away. Her grey hair grew longer and darker as she became younger with every step. The sweater she wore seemed to grow larger on her diminishing frame, and as she neared the other end, she could no longer see over the side of the bridge. She held in her arms her last and heaviest woe, a black rock almost half as large as she was. I knew it was the cancer she had fought for the last three years. She struggled to put it over the side but she was now too short. I began to step forward to help her, only to be stopped by the ranger stationed at my end of the bridge. “She must unburden herself before she is allowed to reach the other side. Otherwise she must come back and try again. You cannot assist.” I looked at him, and for a moment as a tear blurred my vision, I saw the majestic sweep of wings behind him. I yelled, “You can do it!” She looked my way and smiled as she removed her sweatshirt. Using it like a sling, she pitched sweatshirt and rock over the side. She waved at me then continued across, unstopped by the ranger on the other side. From the forest, a young man with my father’s ginger hair stepped out to greet her and they ran down the path and back into the forest. LOVE this story. Such a tender and beautiful imagining. I loved this! Beautiful and heartwrenching. What a great imagination. Beautiful, if the end can be called that! Beautiful, devastating, wonderful and heart-breaking, all at once. My drama coach, years ago, told me I had the darkest humour he’d ever known. I took it as a complement. Grateful you didn’t kill-off the wee lass. Good dialog. My mother took this photograph the first time I crossed the bridge. She had a similar one taken by her mother. She said it was a magical place best experienced alone. So I set off with the confidence of youth and the spirit of adventure she had instilled in me. Before I entered the wood I looked back. My mother was smiling, but even at that young age I could sense the sadness behind the smile. It bothered me for a second, but the trees were calling. My momentary reticence was washed away with the gurgles from the stream below. I never questioned why I entered the that ancient glade alone, it just seemed right. The trees whispered my name, on the breeze, in welcome. This was my place to wander, in bare feet, to feel the warm grass beneath my toes. I would sit for hours reading aloud. The ancient spirits would listen and sigh their approval. When trying to describe the bridge to my friends I struggled to place it in the landscape and they would all say they’d never seen it. But when I needed it, to be alone, to be at peace, I could always find it. Through those awkward teen years when my clothes were never right and boys I liked preferred my friends I would retreat across that bridge and reveal my innermost feelings to the trees. They listened and whispered that everything would be alright, and it always was. So now I stand with camera in hand as my daughter bounces across that same bridge. She stops and turns. I take the photo, smile and try to hide my sadness. For I know, as my mother had and her mother before her, that once she enters that enchanted place it will be lost to me. Love your making the photographer the POV. This story’s just beautiful. The essence of this story is truly beautiful; the idea of generations of mothers that sacrifice for their daughters. You have a couple of passive voice issues that, if resolved (IMHO), the story would be even stronger. Really lovely as is, however. Georgia slowed to a pause as she approached the sturdy wooden bridge with its riveted iron railings, her brow furrowed, peering into the gloom of the forest ahead and listening hard for the slightest sound. She heard the river gurgling and rushing below, heard the swish of the trees as their branches swayed gently in the breeze. Arms by her sides, fists clenched, she moved tentatively forward, one step at a time, soundless in her hemp-cloth slippers, wooden short-bow tapping on her back with every movement. She reached the point at which the bridge turned a corner, sloping down to the path which led into the Old Forest – a place in which all manner of beasts and spirits dwelt. Taking a deep breath and exhaling hard, she marched into the eldritch woods. Under the thick canopy it was twilight as she ran over leaves which crunched and rustled around her, twigs snapping underfoot, branches and leaves everywhere whispering as if the entire forest was watching her. …ran as fast as her little legs could carry her, breathing in ragged gasps as she darted between the trees. Just as she felt the earth tremor behind her, she was blinded by incandescence, covered her eyes with her forearm, relieved as she heard her grandmother shout. Deus ex machina in the most awesome kind of way. You had my heart pounding. The trees of the Allta Woods swayed as the wind caressed its branches, the leaves whispering the words of the Lady’s will to the rest of nature, her children. The river babbled and flowed on towards the Southeast, towards the mighty Dragon’s Claw River. Little Roe gaze at the small bridge that connected the two separate lands, long neglected, the bars rusted and the wood decayed. Just beyond the bridge, she could see a patch of Morning Suns growing in thick clusters, their long stems poking out from the ground. Just what I need, she thought. Eagerly, she stepped onto the wood but then halted. Do not venture beyond the bridge Roe, it is too far from the village. Her father’s words echoed in her mind. But she would only be gone for a moment. It would be her secret. She darted towards the flowers and began to pick them, placing them carefully into her satchel. She pressed her face into one, taking in the fine smell, the golden petals tickling her. Birds screeched, taking off then vanishing. Goosebumps formed across Roe’s small body as she glanced at the sky. A low growl crept into the forest and Roe froze. She skimmed over the woods, but saw nothing. The noise grew closer, making Roe tremble. Roe sprinted towards the bridge, but a small branch caught her foot and she fell. The growl turned into a feral roar and a shadow loomed over her. Roe closed her eyes and screamed. Yet, death did not come. The bear cried out in its tongue, and fell back on the ground. Roe opened her eyes and saw a golden wolf stand above it, blood in its fur. It did not move, and Roe only ran towards the bridge. But the wolf, it didn’t follow. Although, she painfully wanted to. She had to see for herself. Grandma had forbidden it, but she was going anyway. They couldn’t stop her. Angela couldn’t be dead. She couldn’t. She’d told Jess she’d always protect her. She’d said there were monsters in the house. Not the kind in the closet, apparently. Angela had said if the monster ever touched Jess, Angela would slay him. Like a dragon. She bet this bridge led to the magical place, the place her sister often talked about. A place with princes and fairies and happiness, not dad yelling and mom crying and empty beer bottles in the sink. Otherwise why would Ang jump off it? It didn’t make sense. She didn’t know why mom’s face had gone white at some stick she’d pulled out of the trash. She didn’t know why dad had screamed at Jess, calling her words Jess didn’t understand, something about being a ‘hor’, whatever that was. Her dad’s face had purpled. Jess knew that face – it meant bad things were about to happen. She’d run to her closet and hid. She should have stayed. She should have helped Angela. Angela would have helped her. But it had been so scary, the yelling and the hitting and the slamming of the door. Grandma found her later. Jess didn’t know how long she’d stayed in the dark. She didn’t want to risk the monster coming after her. She looked now at the path behind the house, the one that led down to the bridge. They weren’t supposed to go there. Momma said it wasn’t safe. Jess started walking. If Angela had gone to the fairy world, she was going, too. Wow. Still wrapping my mind around that one. Was like a sucker punch midway through. Well told, especially considering it’s from a child’s point of view. It couldn’t have been easy to write this. I thank you for sharing it. I hope Angela has found safety, and I hope Jess finds Angela… what a powerful story. ‘We’ll stop and set up camp at the next clearing,’ said Thomas looking back at his wife. Not long later he was relieved to see the glow from the sunset pushing through the thinning trees. ‘This looks promising,’ he muttered. ‘Not before time love,’ Mary said. The trees stopped and opened up to a large semicircular grassy clearing ideal for camping. Thomas dropped his rucksacks with a happy sigh. Thomas followed Mary’s gaze to the edge of the clearing where there was a wooden bridge. There was no-one on it. Mary saw the young girl and was immediately concerned for her as the freezing night approached. The girl turned and looked at Mary who was now stood by the edge of the bridge. She didn’t say anything. ‘Are you alright?’ Mary repeated. The girl smiled and held out her hand. She stepped onto the wooden slats, which seemed safe and strong, and she looked down at the deep narrow gorge. Mary crept forward, trying not to alarm the girl. She didn’t notice the girl was edging back with every step. Thomas suddenly saw something moving in the trees on the other side. Something large, something wrong. He screamed out, but Mary seemed not to hear. She just had eyes for the sweet lovely girl. Almost in touching distance of her tangled hair Mary put her hand out towards her, then she found she was on the scorched ground on the other side. The girl turned and ran away. Trap sprung. The creature would feast. The woman had watched her infant son for a while. He continued pulling at his ear long after he had fallen asleep. He had been exhausted. She placed a hand on his forehead. He was cooling down now that the medicine had taken effect. She would call the doctor in the morning. For the moment, they both needed sleep. She leaned in and this time kissed his forehead. She left the door ajar. Luke finally roused from his fitful sleep. He pulled himself up to a sitting position and shook his head, hoping to rid himself of whatever irritation it was that was making the rustling sound. As he became more alert, he paid it closer attention. He was convinced it was coming from downstairs. He made his way out of the room on tiptoe trying not to wake his parents. Jessie padded to her bedroom window. She wanted to make out the noise. The one that had drawn her attention and wouldn’t stop. She pressed her ear to the cold pane of glass, but the sound was muffled, just slightly out of earshot. She was sure, if she went outside it would become clearer. She grabbed her coat and stood in the garden. She closed her eyes tightly to stop them from interfering – giving the noise her full attention.But it seemed still to linger somewhere beneath the surface: it scratched in her eardrum like an itch. If she could just get closer to it, she was sure she’d understand what it was. She walked through the front gate, down the windy path, over the road that took her to the park. She stood looking at the bridge. She was positive it was coming from over there. I love the way this builds up, and I love the way it’s so oblique. It’s one that invites reading and re-reading. Really great story, Marie. I watched her walk ahead of me. I wanted to walk with her, but that wasn’t allowed. This, she had to do alone. I watched her hair dance in the strangely warm breeze and I knew that in a moment her hand would reach up to her face to push the stray hairs from her eyes. She hated that. We had rehersed this moment a hundred times, telling her she mustn’t look back. I watched her ivory fingers clench into a tiny fist beneath her over-sized clothes, and I knew her fingernails would be painfully digging into her palm. She was getting ready. We had readied her as best we could, equipping her with tactics – ways of fighting for herself should she need to. I watched her hesitant footsteps grow slower, her shoulders following suit dropping slightly with every reluctant step. She didn’t want to do this. And we prayed that now the moment was upon us she might battle her worst fear – the one we all have for ourselves when facing the unknown – and remember all that we had said. I watched her with instincts so strong; my eyes scanning the surroundings for unseen danger, silently penetrating her cool facade so that in her heart she could still feel me there. Then it happened as we knew it would; the air was ripped apart with a high-pitched, piercing shrill. I watched as she started to turn, her profile rounding back towards me. No, don’t little girl, please…don’t. But it was too late. Droplets of tears were gathering, and I knew that in the next blink they would fall. “I will miss you mummy,” her final words before her teacher, taking her by the hand, led her into class. And I watched her disappear from sight. This is so sweet and delicious. I think the story would stand form even without the last line. Nice twist on the prompt. Well written piece. I hoped I would, anyway. His hand was a dead weight on my shoulder. The bridge boards creaked beneath his weight. Red rimmed eyes peered from a thicket of beard and wild hair. His breath rattled and bubbled like a broken down old steam engine. I wrinkled my nose as he leaned closer. He was one of the bad ones. Seeping sores scattered his sweatshirt with red and yellow patches. One bloody, weeping toe peeked through his ripped tennis shoe. His grin was a ruined castle of broken teeth, and he smelled like the cesspit after Daddy got too sick to empty it. He bent down. A filthy, nail bitten finger raised my chin. I clenched my muscles, tried breathing through my mouth. It didn’t help. How long had it been? Had Missy and Laura reached the woods yet? I tried to sneak a peek across the bridge but the finger stopped my head turning. I tried to smile at him. Like I’d seen Momma look at Daddy before they got sick. I untied the front of my coat – and showed him. The roar of the sawed-off twenty gauge made my ears ring, but the finger was gone, and the smell was now of gunpowder. He reeled back, toppling from the bridge. I sprinted for the woods. The gunshot would attract more of them, I knew. Wow! This is so well described and atmospheric. Excellent! Terrifying, but fabulously written. I was terrified for her. You set this up so well. The ending is great. I looked to see how far Emily had got and even thought of rushing after her and dragging her back but I knew I daren’t, Jimmy would kill me. I thought back to the weeks Jimmy had spent in the library researching the bridges around here, looking for the right one. According to the legend he’d found, this was it. All he needed was someone to walk slowly across the bridge, making as much noise as possible. His little sister had been the perfect bait. Emily stopped. She could definitely hear a voice from beneath the bridge and it didn’t sound happy. Moments later an enormous Troll clambered over the side and stood in front of her. She took out a bag of sweets, slowly turned around and started walking, dropping a trail of sweets behind her. If her big brother was right the Troll would follow, eating the sweets as he came. Jimmy was right of course, Trolls do love sweets, but with a little more research he would have discovered that, while they enjoy starting a meal with sweets, they love finishing it off with the crunchy bones of young children. What a hungry troll sweets and children’s bones. very well thought out take on the prompt. She watched the girl make her slow passage across the wooden bridge. The girl walked with a sedate purpose. She had her long unbraided hair trailing untamed down her back and it framed her face but curiously it did not hide her eyes. Nothing she guessed could have stopped the intensity of those sapphire like eyes. As she thought The girl, sapphire, for that was what She’d named the girl, was almost upon her reaching out her arms hungrily with intense need. The alarm went off bringing Susie to with a not particularly pleasant start. Bleary eyed she stopped the alarm and started her morning ablutions. While staring at her face in the mirror she reminisced of her sleep subject . She’d seen Sapphire her mystery girl again. On the same bridge. It was always the same bridge she saw her wending her mysterious way. The bridge was so hauntingly familiar as well but whenever she thought back during the day she never saw water but a void. Susie had no idea why and the bafflement it caused was making her slightly cranky and affecting her home life! such as it was. Susie was not sure if it was because she’d dreamt the same dream for the last ten years or if it was somewhere she’d been to but couldn’t remember the details! As Susie walked to the station see thought about her next plan to solve her mystery occasionally muttering to herself. Who was the girl who seemed so strangely familiar? Why did she continually reach out for Susie? Or was that to her? Susie vowed, as reached the station that she would find out one day. She had to she thought as she made her slow passage across the wooden railway bridge to await her train to the office. *she thought not see thought!! She heard voices getting closer. She stuck her head between the rail and looked for daddy. He had climbed over and after telling to wait. When he turned to her he smiled with tears in his eyes. Daddy was starting to cry. He opened his mouth to tell her something when the bridge suddenly shook hard. She had fallen to her knees and was grabbing a post when she thought she heard a scream. The little earth rumble was over, but daddy was gone. Now she paced. The sun had crossed through the opening in the trees above while she waited. It was getting to be too hot. Her tummy grumbled. Daddy had said that they wouldn’t need to bring any food, but she had brought a pack of gummy bears any way. The voice were getting closer. She ran to the other end of the bridge and found a grassy spot to sit and eat. While she ate, she heard the voices pass by with out stopping. The gummy bears were not that filling and she was still hungry. She got up and went back to pacing the bridge, waiting for daddy. She was a good girl. Daddy would be back in time to get food and take her to mommy. As I watch my daughter, wearing a hand me down coat she wouldn’t grow into for another year, play on the footbridge of the pond in the local park, the voice of southern belle Loretta Lynn, sang Coal Miner’s Daughter softly in my mind. Money isn’t quite as tight for us as it had been for my own parents. I remember, years ago before summer’s furnace raged in full, riding to the auction in Daddy’s rusted red pick up to buy a hog. We’d bring ’em home, fatten ’em up and come Thanksgiving, we’d have our yearly cochon de lait. Nothing like the smell of a hog roasting in the turning pit on a brisk November day. We’d make cracklins to sell at the local grocery store. Daddy would pick out the best bits for me to crunch on while I waited for supper. His outdoor kitchen had a wall on only one side, but was surrounded by trees that blocked most of the wind. Come nightfall, cold managed to seep into our sanctuary. He’d take off his camo jacket, and ask me to wear it for him. Said he needed his arms and hands free to cut up the hog. Didn’t want to dirty his sleeves. Didn’t want me to catch cold, I think. Yeah, I didn’t have a cell phone or an iPad. Hell I used the toilet in the outhouse more often than the one inside. I did have love, and a happy childhood. Looking at my own daughter, I know what I have to do. Like my daddy, and that coal miner, I’ll make sure she has love, even if we don’t have much else. Crappers. I just realized I have five words too many. I don’t know how I understood to read that as a ten word leeway on either side of three hundred. If you need to delete it, and/or disqualify it, I understand totally. May I, pretty please with roasted duckling for your High Dragoness, resubmit, within the allowed word limit? My sincere apologies for exceeding the limit in the first place. Of course! No worries at all. Email me the revision (via contacts page), and I’ll make the swap. I’ll get on that right away. Thanks a bunch! WHOOOOOOOOOOOOOOOSH! changed! just like magic! Really nice. Loved the way you combined the music and story. The musical notes to punctuate the song lyrics is a lovely touch. The caw of a crow was followed by another, and then another, the air around Eliza filling with the noise of a thousand cries, but she heard none. For her there was nothing but the bridge. On the other side of the bridge was death, the camps where so many of her people had been sent and from which they would never return, and on this side of the bridge was death, a suffusion of war and famine and pestilence. The soldiers behind her were barking out their orders in their pidgin version of her language, but she heard them no more than the crows. For her there was nothing but the bridge. Eliza’s nerves tingled at the sensation of stepping onto the bridge, the slight give of the wood, the awareness of being so far above the ground. She placed on hand on the railing, polished smooth from ten thousand other journeys. She could picture them in her mind, terrified, crying, defiant, their attitude not mattering at all once they set foot on the rock at the far side. Her fingers found a rough spot on the underside of the railing, and she played with the texture, thinking of the living thing that gave its life to be this bridge, leaves reaching into the sky until being toppled over by men with axes and saws and thick hemp ropes. The movement of the bridge maximized as she reached the middle, diminishing as she made her way to the end. Her toes, bruised and battered, but not numb, caressed the wood as the hands of the men who first laid this bridge must have, testing for the strength needed to support itself for centuries to come. The last step lay ahead, but she didn’t see it. For her there was nothing but the bridge. Talk about caught between a rock and a hard place. “Yes,” Susie cried out with a smile. “My turn,” said her imaginary friend. “Okay,” said Susie tilting her head to one side and running her little fingers through her long hair. Together they skipped across the bridge. Spooky. I almost wish you hadn’t said ‘her imaginary friend’; I’d prefer to have it left unspoken. But I really loved your take on the prompt and your use of dialogue. Great story. Amelia pulled the heavy front door closed behind her and placed the sealing charm upon it. She had no doubt that, much like the cantrip of slumber she’d placed upon her family, it would not last as long as she might wish but it would have to do. She was a very young girl and, though she had more arcane potential than any of her family in five generations, her objective was unaccountably dangerous. But, to Amelia, the decision was also infinitely logical. For months now, the wards had been failing. The eldritch energy that powered them was not, it would seem, inexhaustible. With each passing day, there was less of a barrier between those she loved and the Deathlands. While there had scarcely been even traces of the nether beasts in her lifetime, her father and her twin brothers had taken down three of the foul creatures in one week. They had even dragged one of the stinking carcasses home for the Supreme Council to peruse. She frowned at how easily that assemblage of doddering old men had discredited the obvious evidence. Though her family thought her unaware, Amelia had pierced their concealment spell and listened to their battle plans the night before. She was to be left in the care of servants in the farthest western regions of the family lands. Meanwhile, the entire clan meant to wage battle and seal the Deathlands away with a fresh infusion of power to the wards. To young Amelia, it seemed placing so many at risk was…unwise. Crossing the bridge that led to the barriers, she seemed quite confident a single small mage, such as herself for instance, could more easily infiltrate where a large group could not. With an involuntary shiver, she only hoped she was correct in her assessment. It was a very nice bridge Caleigh thought.Sturdy wooden planks on a steel frame. Wood side rails taller than she was with a metal handrail on either side. It was weathered but still solid. Small clumps of rugged weeds grew along the edges of the bridge. Twenty feet below, the little steep-sided creek burbled and gurgled as it trickled over the sharp stones. She hummed a little song as she walked towards the woods on the other side. She stomped her feet as she went. She added a couple of skips. Her eyes were busy though she looked straight ahead. They were wise for a seven-year old. The forest was dark and creepy, filled with strange rustling and chitterings. She ignored it. aleigh hummed louder, a happy, jaunty tune. A cold breeze blew over her. She shivered and pulled the over large shirt she wore a little closer to her body. The path at the edhge of the bridge bent to the right. She couldn’t see what lay beyond it. The bridge creaked and groaned under her as though some heavy weight was stressing it.She broke out into song. Her voice was high-pitched but true. “You are the sunshine, the bright, bright sunshine!” She sang. She could feel something walking on the bridge behind her. It crept closer quietly. She could smell musty, rank fur. It’s hot breath blew don the back of her neck. She emitted a loud scream of fear and threw herself flat on the bridge. Wang! Tung! Went the crossbow. The troll thudded to the bridge. Its legs thudded on the bridge for several minutes. A large iron bolt projected from its body. Caleigh rose cautiously after it stilled. “We got it Da! We got that nasty old troll!” The bounty hunter’s daughter cried in glee and did a victory dance. Sorry miscounted. Can I remove the line “The troll thudded to the bridge.”? I ran and count and came up with 305 as is–looks fine to me! She stood at the base of the bridge, clutching Teddy’s paw. Behind them soft, tranquil music played. Peace and comfort tickled her back. She stared at the bridge, enshrouded in mist. Frantic voices called her name, tugging at her heart. “They want me to come back, Ted.” She moved onto the boards, gasping when red splotches covered her body. A dark figure rose up beside the bridge, grasping a wickedly carved weapon in his ghostly hands. Teddy squeezed her hand. “Run. He can only take one of us. They’ll take care of you once you reach the other side.” He shoved her forward. The blade sliced through the air. She rolled, wind rushing over her curls. A cry escaped from Ted as he was hurled over the bridge railing. The mist turned into a blinding light. She blinked and found her mother standing over her, clutching her hands, tears flowing from her bruised face. “She’s awake,” Mother cried in relief. Masked people crowded her bed. Her heart plunged, realizing the loss Teddy spoke of was her childhood dreams and fancy. This tale had a really authentic tone and feel to it, well done. The last line is redundant IMO, the story stands without it. I saw her again, the scrawny little girl with wavy long hair in an ill-fitting raggedy sweater, walking alone on a desolate bridge. The air was ominous. I only saw her back, but I felt in my heart that she was sad and lonely. The deep green forest surrounded her as if taking her in protective custody. A wave of maternal love, tinged with sadness, rolled over me. I ran after her, wanting to pick her up, bring her home, groom her, feed her, and take care of her. For always! But I was motionless. I called out to her, but I was speechless. I gasped; I was running out of breath. I woke up soaking in sweat. I could not get that girl out of my mind for weeks. Somehow I knew she needed help. But she had vanished along with my fleeting dream. I felt unfulfilled. I wanted to know her history; I wanted to help her and bring her story to a happy conclusion. I was confused by my sense of responsibility towards her. I berated myself for dwelling so long on a dream. But I also longed to see her again. I exhausted myself each day hoping to spark the dream again. But sleep eluded me. My thoughts crisscrossed and took wild rides on roller coasters of emotions. On one especially precarious turn, I saw a flash of her. The little girl from my dream! It was kind of strange that she had the face of Lily, my best friend from preschool. Lily, who sometimes showed up at our house with black and blue marks on her back and legs! Lily, who would just stare at everybody, speechless! Her big brown eyes, sad, full of questions! I have the answer now, but it is too late. Gosh. That had an ending I didn’t expect. Sad and touching story, and well handled material. This really tugged at the heart. Chilling and all too much holding truth! She stumbled through a whistled rendition of “twinkle twinkle little star” as she strolled the park. Having just figured out the mechanics of whistling, she was having more fun being as loud as possible than actually sounding good. This was her favorite section of the park. Many afternoons were dedicated to tossing rocks and sticks into the small river below her and watching them be taken away in a hurry. This afternoon though, her one goal was to get through the woods and to grandma’s kitchen on the other side. Cookies and soda awaited her. If there was one thing Grandma loved, it was loading her up with sugar before heading back home. Crossing the bridge meant she was half way there. She rolled up the sleeves on her big red sweater and skipped off. The brush on the far side of the bridge began to rustle. Birds abandoned their trees in a flash of activity. She stopped whistling. Out of the bramble emerged an enormous wolf with teeth gnashed, drool spilling from the snout and eyes fixed on its next meal. It stepped out of the shrub and inched closer to the little girl. Growling louder as each paw touched the ground; it kept an unblinking gaze upon the child. The park suddenly felt very empty and very small. The little girl, in her red sweater and light up shoes, had now crossed the bridge. She thought for a moment of simply turning around and forgetting the whole mess. She thought maybe this time the enormous wolf before her would simply walk away. She though it had learned his lesson last time they met. She thought it was smarter than all this. The wolf thought the red sweater and Velcro shoelaces would slow her down this time. I really do like the imagery of reaching the clouds. Bea could hear them arguing in the parlor, their voices rising until they were shouting. “She can’t last forever. We’ll divide things up then.” That would be Annabel. Her voice sounded so cold. Bea pictured her dark hair combed back from her face and jammed into a tight bun, her green eyes cold as the sea. “I want the emerald. I was promised the emerald,” Elissa said. Her voice sounded bored. She would be draped over a chair as sensuously and lazily as a cat. “It’s the money that counts. Plenty of that. I’m going on a spree for once.” The gleeful voice belonged to Katie. A tear rolled down Bea’s cheek, but she brushed it away. If her girls had grown up spoiled and greedy, wasn’t some of the fault her own? She’d always wanted the best for them, to give them the things she never had. That’s why she’d married Robert. He was destined for great things. They lived a grand life. Bea slipped out of her bedroom and through the little side door that led to her garden. The bridge was there. It marked the end of her property and the woods, and as always it beckoned her. She’d walk carefully just to the other side, but when she stepped on the bridge, she felt the terrible ache in her legs diminish. Strange, she thought. The more she walked, the better she felt. Her skin began to grow firm, her joints limber. She was growing younger. Children’s laughter rang from the woods. Then she saw the lady in the shadow of the trees. “Have you come to take me?” Bea said. Mysterious. A second chance is so tempting.. at what cost.. but maybe it’s worth it considering what she’s in the middle of. I love that she grew younger as she crossed the bridge. Nice writing! I love the ending! Seriously, it’s amazing! This gave me goosebumps, tingling in my scalp! Reminiscent of The Dark Tower. Leaves me wanting to read the whole story all over again, knowing that this time, things will be different, better. There is so much more to this story than I thought possible in 300 words. It’s like looking into a pool of water that you can see clear to the bottom of, but never guess at its depths until you’ve jumped in. Sorry, this was supposed to be a reply to Sarah Cain’s story. I don’t know where my head is today. Evan tilted his head and squinted at Jared, the sun was just high enough that the glare hid his brother’s features so he couldn’t tell if Jared was kidding or not. Jared looked at the bridge and sighed. Sometimes there was just no getting through to his brother. Evan rolled his eyes and strode out onto the bridge, determined to prove his brother wrong. As he passed the girl, he turned, and ran screaming down the path. Jared swore. This was the last time he’d take his brother to the haunted trail. Funny.. great banter between the brothers. I love local legends and how they ‘haunt’ us. Some local legends are downright scary. Glad you enjoyed it! Thank you! Emmy padded up the wooden ramp, her too big sweatshirt swallowing her hands as she held her head up; looking towards the forest. So much adventure waited for her, just a few steps from where her parents and siblings were gathered for a picnic. Twisting her head, she looked behind her, to see that no one had noticed her escape. Smiling secretly, she hurried her pace a little. She wanted a few moments to herself before someone decided to come looking for her. Hopping down from the wood bridge, she crept into the deciduous forest, her body low as she pretended she was an intrepid explorer. She was on the hunt for the elusive timber mouse. Giggling softly, she tiptoed farther into the woods, searching and peeking for any sign. She found a burrow where a rabbit or chipmunk lived, but didn’t peek inside since she didn’t want to disturb their home. A little farther and she discovered a bird’s nest, three little birds inside. She crouched down, watching them from a distance before heading off on her search again. Emmy knew it would be difficult to find the elusive timber mouse. She turned, intending to go deeper into the forest when she heard the first call. She headed for the sound of the yells, her feet hurrying at first, and then running as the yells of her name got more frantic. As she burst out of the forest, her feet hitting the wooden ramp and pounding down it, her parents rushed to meet her. Her father sighed, but gathered her close, hugging her. There was no response to give to that. Emily’s innocence, her love of nature shines through. I want to give her a hug. And the parent’s fear not knowing where their little adventurer got to will be with them through her life. 🙂 Great feel to the piece. Children still trust the world, don’t they? When the shooting came closer, it was night. Annelise’s mother threw cheese, bread, and a skin of water into a cloth bag. She dressed the girl in her father’s tattered, oversize sweater. He did not need it. He’d been taken away by the Germans shortly after the soldiers arrived and found his shortwave radio. He was sent to a camp somewhere east. Annelise’s mother did not wash the sweater after he left. Her daughter seemed comforted by his still lingering scent. The flash of gunfire was terrifying, but staying in the home was worse. Her mother hoped it was safer in the woods, away from the shooting. They had only made it to the house next door when Annelise heard her mother cry “Oh!” and stumble. She clutched her side, but said nothing more and guided her daughter on. In her head, Annelise heard the words her mother would say if she wasn’t so desperately silent. When her mother collapsed, Annelise held her hand. She did not cry, but spoke softly to her mother describing the white parachutes that drifted down, down, down, disappearing into the fields in the distance. She heard clicks and shots and rustles and remained quiet, holding on to what remained of her mother. Annelise held her mother’s hand as it grew stiff and cold. At dawn, she saw her mother’s face, tortured, not at all peaceful, a trickle of blood drying on her mouth. In the rising sunlight, she saw the woods ahead, tantalizingly close. Maybe the soldiers in the parachutes had gone there. Behind her lay the village and the bad soldiers her mother had feared. Annelise kissed her mother’s cheek and put the cloth bag over her shoulder. She only needed to cross the bridge and she would be safe. Wow, great tension, very sad, but with a hopeful ending. Nicely done. We stood there and watched the girl crossed the bridge, watched as she got to the other side. The other side. Of the bridge. We stared at her incredulously. She hadn’t been lying after all. “Come back.” The blacksmith’s voice was horse with disbelief. Even across the bridge we could see little Helen’s face screwed up in exasperation. Still, she came back and stood there, a little insolently. “How do you do it?” Maeve was scared. For all that she was a person who was calm when dealing with childbirth, anything outside of her remit had her flapping like a goose at Christmas. She looked me with her head on one side, thoughtful as she took in our fear. Was she looking a bit more –other- than she had before? That was too much for Maeve. She turned and ran, wailing. The blacksmith and I exchanged glances. We hadn’t heard anything. Surely if a little girl could cross a bridge we could too? “Not me.” The blacksmith backed off. I looked at the bridge for what felt like ages. If Helen could do this then so can I. Hesitantly, I put one foot on the bridge, took another step, and another. Maybe this would be ok after all. Moving faster, I am halfway across when I hear the first growl. I spin around and stare at the blacksmith. I was wrong. The growls get stronger and then, inevitably, the first troll appeared from under the bridge. I love trolls – unless they come after me, of course. The new Bay Bridge just opened here in San Francisco and the powers that be removed the troll that someone had welded to one of the columns. Let’s hope they’ll replace it with a good luck charm. There were trolls on the golden gate bridge? That’s amazing. I hope they put him back. She counted three hundred seventy-two planks on the bridge. She had learned to write the numbers in as many days. On an unlined drawing pad her father had given her for her fifth birthday she recorded each number in a new color, and then she drew an X through it to mark the passing of that day. After the first one-hundred-twenty days she started over in her box of Crayolas, only then choosing for the second time Mango Tango, Outrageous Orange, Macaroni and Cheese, and on down the line to Razzmatazz and Timberwolf. The names of the colors made her smile. She was a solitary girl content to linger in the trees sketching the wild grasses in the lovely manner they are often depicted in scientific journals. She drew the underside of ferns, revealing meticulous lines of tiny spores, and rabbits quietly munching, their soft ears drawn back in focused contemplation. Every morning she rose before the sun and walked to the bridge. Some days she paused to watch the passage of a hat or a shoe stolen by the river from the inflatable rafts that were often to be seen in the summer overflowing with tourists excited to successfully navigate the churning waters. On the three hundred-seventy-second morning, the same as the number of planks, she knew this was the day her mother will return. Her father had not told her this was so. No one at the commune had told her. Yet she carried with her the pages of x’d numbers to show her mother how long she’d waited. The mist rose from the river as she counted the last plank. A form materialized. Molecules took shape. She’ll stand on that last plank until her mother arrived to lift her long hair from her back, and tell her how much she’d grown. “The mist rose from the river as she counted the last plank. A form materialized. Molecules took shape.” NICE!!! 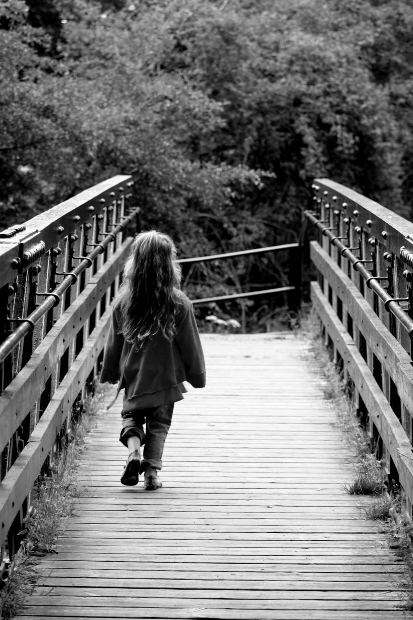 The girl walked fearfully across the bridge, keeping the tears in. There was no turning back. She had said her good-byes and there had been tears. She came to Dragonwood clearing. The villagers left fine gifts to keep the Dragon happy and the people safe. It had been made known that the brightest, strongest virgin would be required as a gift and Liathara had the honour of being chosen. For the safety of her sisters, her family and her people. She knew she had to be strong. A few steps into the clearing. She did and there was a woman in a fine blue dress standing there. The woman’s hair was long and white and her face showed many years. Liathara stood there in disbelief, her world shaken. Me likey!!! I love the ending!!! And “Liathara of Woodley” rolls off the tongue nicely. Enjoyed the read!!! Nice switch from the virgin getting eaten by the dragon. She slowed her pace and listened, hoping to hear Maddy’s voice. Only the rustling of leaves and the trickle of a nearby stream replied. Teri had heard the stories of the nearby neighbors. She had heard the rumors of the Willup Boys sneaking through holes in the fence and carrying off girls. Mostly talk by the older girls trying to scare the newcomers, she thought, but everyone, including Ms. Jenkins, cautioned everyone not to get too close to the fence and certainly not to go beyond it. Beyond the grass, a mop of brown curls belonging to a small figure in a white robe took tiny steps across an old footbridge. A sense of relief passed through Teri’s entire body as she rushed towards Maddy. The young girl heard her coming and stopped to face her. “I had to go see her,” the little girl said. “I wasn’t dreaming!” Maddy screeched. “She said she would never leave me.” Tears formed in her eyes. No, I am not walking towards my ruin. Much as you wonder why I’m out alone after sunset, I’m simply here for rumination, nothing extreme. He’s done it again – he came home drunk. Maa had hidden her money behind the stove this time, hopeful he won’t think of checking there. But he did – he can always sniff out money when he needs a drink. He came to me, brandishing the notes with sheer delight. I cowered at his glee. He was going to give us a hard time when back. Like most other nights, he got into a row with the neighbours, and they thrashed him. They’re not as mean-spirited as him, but they do derive much pleasure from stripping him, pointing at him down there and tittering. They do it because he is too sozzled to hold up. When they’re done with their voyeuristic jaunt, they throw him into our compound. It is for me to dress him up and drag him to his cot. I have seen my father like no girl should have to. Today, he had an early tryst with the bottle. It was barely even dusk when I heard his roars outside the compound. But I was exhausted. I let him be. I had no idea he would gather the strength to walk right in and overpower me. My back is on fire. I lost consciousness sometime mid-way, so I am not sure how many times he bit me. But Maa did boil a lot of leaves for her concoction, so I’m guessing it’s bad. I refuse to call this deranged man my father any more. So you see, I’m simply crossing the bridge for some peace and quiet. Besides, I need to pick the flowers whose seeds I’m adding to his tea in the morning. its sad that such things still happens in our country. Thanks for sharing this.. Good one. Emily’s shoes made a hollow sound on the wooden bridge over the little creek as she backtracked to the park’s entrance. The sound of the water rolling over rocks made a pleasant sound that helped to slow her heartbeat down after the excretion and thrill she retained for what happened only minutes ago. “Three homes in less than a year,” Emily said aloud, having learned long ago that the only words she could trust, really trust, were those that come from inside her. The metallic, salty taste in her mouth would eventually fade but the blood on the front of her jacket will leave stains. “Why does everyone always want to do what’s best for me,” her shoes were on the graveled path and her legs started to feel like they are on fire from the strain of walking uphill. A bird chirped up the path, and then swooped down from the tree limb catching a butterfly in it’s mouth and flapped wings hard as it champed down to make sure the kill is clean. “Nice bird, that bug will make a good meal for you and yours,” Emily smiled and stepped up her pace with renewed vigor. Bridges. They’re only transitions. One uses them for a short while, to get from one place to another. She told me her name was Suzie, but I have my doubts. She looks about 6 or so, unless you look in her eyes. Her eyes are very, very old. And cold. I first met her in early October of last year, in a nearby park. I walked across a foot bridge, and stopped halfway across to watch the little stream flow underneath it. “Not very many people stop in the middle.” she said. I turned and saw a little girl. I smiled and said that I was only taking a look at the water. She looked at me with those old, cold eyes of hers, for what seemed like forever. Mary Anne passed the bridge every day. She never saw anyone cross it. She never saw anyone go in or come out of the woods. Her mother told her it was because that one day there was no reason to go. Nature was dirty and dangerous. It had been over a century since anyone went there. Yet no one claimed it. It had not been crushed beneath the big bulldozers or covered up by a glistening skyscraper. The forces of technology left the woods alone. Every day Mary Anne passed the bridge. Every day she felt called to the reason that it was left alone. The forest beckoned her with its darkness. The old wooden planks of the bridge could hold her weight. She had been almost to the middle when her mother called her back, panic in her voice. Mary Anne had dutifully taken her mother’s hand, but the nature beyond was still there. Calling to her, beckoning with its secrets. The force of a little girl’s curiosity could not leave the woods alone. One day Mary Anne made a plan. She awoke in the early morning before her mother’s alarm pulling on her favorite sweater, the one that was so big she could hide extra snacks in the sleeves. Her sneakered feet carried her towards the bridge she passed every day. The wood whispered beneath her feet as it carried her from the steel of her home. The first touch of her feet on living soil filled her with love. The bark of a tree. The softness of a flower. She played until she heard her mother’s voice. She knew this would not be the last time she visited this place. The force of the beauty of nature would not leave her alone. Totally unexpected perspective! The beginning reminds me a bit of “Once On This Island” but of course within a different pantheon. Leigh never looked back anymore. She clenched her fingers around the loose elastic of his sweater and put one foot in front of the other. The old bridge creaked a melody she’d memorized long ago. She made this walk at least once a week – sometimes more when there was exciting news to share. Like today. She wore his sweater every time, but then, she wore it almost always, except when her mom convinced her otherwise. The elastic had lost its snap, drooping low over her hips, and the color had faded until it was nearly indiscernible. But it was still her favorite. On the other side of the bridge, Leigh paused. Her fingers found the grooves etched into the wood years ago, worn smooth by the constant attention of her hands. He’d marked the bridge to outlast them both. It was their secret. Leigh hiked the sleeves higher on her arms and brushed back her hair. He loved it long, so she’d never cut it. She huddled in his sweater, caressing the crude heart that housed their initials. The sun dipped into the river, reflecting off the water to color the foliage around her. Sometimes, she wished she could stay, rather than turning right at the forked trail that led home. She could make the trip in the dark, but her mom still worried. And they were celebrating tonight. For a heartbeat, Leigh considered turning back. She could sleep in the secluded grass, under a starlit sky untouched by the harsh world that waited. He would be close, and his sweater would keep her warm. Forget that he would never walk her home. Forget he couldn’t hold her. Leigh dropped to her knees, and the college acceptance letter drifted to the ground. “I miss you, daddy,” she whispered to the wind. This was lovely. Powerful emotion, skilfully described. Well done.